Custody service for Anxin account is an asset custody service that ICBC, as entrusted by customer, opens a fund custody account, supervises the use of funds and discloses the information about fund custody and account to the customer according to the custody agreement signed with the customer. Through such service, ICBC can, by serving as a credit agency or payment agency, effectively safeguard the safety and independence of various trading funds and earmarked funds, ensure that funds as used for specified purpose only, and reduce default risk in the trading by constructing an integrity mechanism, to effectively disclose information, improve customers’ credibility and financial management level, and provide customers with secure custody services. Institutions or individuals which require services such as asset safekeeping and payment monitoring provided by a custodian bank during commodity trading, ownership transfer, M&A, etc., including owned housing intermediaries as well as buyers and sellers, and equity trading participants etc. Institutions or individuals which need a custodian bank to monitor the use of earmarked funds in the earmarked fund management areas including people's livelihood funds, fiscal funds, performance deposit, and charitable funds, as well as prepaid card consumption, including public resource trading platforms, traveling service agencies, prepaid card issuers, and real estate development or sales enterprises. ICBC, according to the needs of customers, establishes a special custody account system for the customer through professional custody system. Separate safekeeping and independent accounting are applied to the assets under custody. Measures including account checking and quota reserve are adopted to effectively ensure the safety of assets. Accounts can be opened in batch or through direct connection to system, so as to improve efficiency. A customer can transfer funds from its own account to custody account or from custody account to the designated account through bank counter or Internet banking system. ICBC can provide single or batch receipt and payment services, and realise automatic receipt and payment pursuant to the timetable, period and amount specified in the custody agreement subject to the needs and authorisation of customers. ICBC may, as requested by customers, supervise fund flows, use of funds, payment limits and payment channels through its custody system, to ensure that funds are used for specified purpose only. In the meantime, ICBC can provide automatic approval service for customers and their superior departments through Internet banking system. Upon the approval of payment application by superior departments, funds will be automatically paid to designated account, thus raising approval and payment efficiency. ICBC may apply detailed accounting to the funds in each account in the multi-level custody account system and clearly record each receipt and payment transaction for customs. Besides, interest will be accrued for the funds in each account as per the interest rate as agreed in the custody agreement, and it will be paid to designated account on the interest settlement date, so as to save the time of interest calculation and payment for customers and improve interest settlement efficiency. ICBC will send a professional custody report or bank statement to customers, to disclose the fund information in each account under custody account system. Meanwhile, account information inquiry service is provided to customers through Internet banking system. Customers who are not users of ICBC Internet banking can also log on ICBC Internet banking to inquire about the balance and breakdown of custody account and check account information in a timely manner. i. Rich experience in business processing. In November 2002, ICBC launched custody service for Anxin account under the approval of the People’s Bank of China. The bank, by serving as a credit agency or payment agency, helps customers conduct transactions smoothly and reduce default risk in the trading to the maximum extent. Meanwhile, it assists regulators or appropriators in supervising the use of funds, thus ensuring that funds as used for specified purpose only. ii. Professional custody service system. 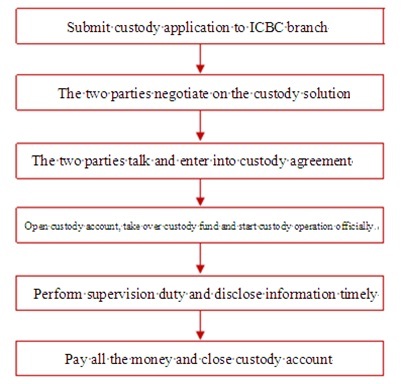 Through the fund custody service system for receipt and payment accounts, ICBC can establish a multi-level custody account system and set multiple custody controls according to customer's needs, for the purpose of full-fledged and automatic fund custody and supervision. iii. Extensive customer service network. All the tier-one (directly-controlled) branches of ICBC have launched asset custody service, thus convenient and efficient custody services can be provided to customers by means of branches located throughout the country and advanced Internet banking system. iv. Good reputation in the market. Since 2004, ICBC has successively received a lot of awards (e.g. “Best Custodian Bank in China”) granted by prestigious financial magazines at home and abroad, such as the Asia Money, Global Custodian, The Asset and Global Finance, hence becoming a custodian bank winning the most awards in China. By virtue of its reputation in the market, ICBC can effectively enhance customers’ credibility and help customers expand market with its custody service for Anxin account. i. Custody product for Anxin account (existing housing transaction funds): The buyer, seller and intermediary agency (if any) to an existing housing transaction sign a custody agreement with ICBC, and then ICBC opens a fund custody account for the existing housing transaction. The buyer transfers the funds for housing purchase (including deposit, down payment and loan) to the custody account. Upon the completion of transfer of housing ownership, ICBC pays the funds to seller's account or designated account according to the transfer instruction as agreed in the agreement. The product can protect the safety of funds for existing housing transaction, enhance mutual trust between buyer and seller, push the conclusion of transaction and safeguard the legitimate rights and interests of two parties. ii. Custody product for Anxin account (prepaid card funds): ICBC and a prepaid card issuer sign a custody agreement, to protect the safety of customer’s excess reserves, safeguard legitimate rights and interests of card holders, supervise the use and transfer of funds, ensure that the use of funds complies with regulatory requirements, disclose the information about fund management, and enhance the credibility of card issuer. iii. Custody product for Anxin account (public resource transaction funds): ICBC cooperates with related government organization. It opens a fund custody account during the management of public resource funds including bidding margin for government procurement project, deposit for safe production and earnest money for land auction, so as to separately record fund receipt and payment transactions for participants of public resource projects, supervise the closed operation of funds, and improve the efficiency of government organization in the management of public resource funds. iv. Custody product for Anxin account (traveling security deposit): As per the State’s regulatory requirements, ICBC opens independent custody accounts of security deposits paid by institutions, organizations or individuals to join a trip, safe-keeps the security deposits and remits, pays and supervises the fund and offers fund information inquiry according to the custody agreement. v. Supervision product for Anxin account (fund sales settlement funds): In cooperation with independent fund sales institutions and sales payment clearing institutions, ICBC opens special settlement account for safekeeping and transfer of fund subscription & redemption money, checking fund trading data and overseeing safety of fund sales money. vi. Custody product for Anxin account (special housing funds): ICBC provides custody account opening, pooling, independent safekeeping, scheduled transfer and fund use monitoring in respect of the special housing funds. Funds under such custody include housing maintenance fund, home pre-sales fund and provident fund. vii. Custody product for Anxin account (financing repayment fund): ICBC signs a custody agreement with a customer which raises funds through loans, issue of shares or bonds, or finance leasing, to provide custody service and make payment for such funds, supervise the use of funds by issuing a custody report, and assist the customer in ensuring that funds are used for specified purpose only, improving financial management efficiency and enhancing creditability. viii. Custody product for Anxin account (trade transaction funds): ICBC enters into custody agreement with the two trade parties for safekeeping of the transaction fund. Besides, ICBC transfers money or credits the money directly into the counterparty's account on the conditions agreed upon by the two parties to ensure that fund are used for specified purpose only and enhance the credibility of trade. ix. Custody product for Anxin account (earmarked industry funds): ICBC provides custody account opening and assists in pooling, payment, special account keeping, clearing and transfer monitoring, among other services, in respect of funds in special application fields of an industry and with designated purposes. Funds under such custody include traffic fines, power grid charges, schools’ training funds, medical care payment, education funds, and charity funds, etc. established by governments, institutions and enterprises. x. Custody product for Anxin account (judicial case funds): ICBC collects, for judicial litigation cases, litigation fees, fines and other case funds to be paid, provides custody account opening, fund safekeeping, transfer & clearing and fund use monitoring and other services, conducts specific case and number management as well as separation between funds under custody and court-owned funds, and satisfies such requirements as the scattered remittance and payment of case funds, quick payment and convenient inquiries. xi. Custody product for Anxin account (appropriated and guarantee funds): ICBC appropriates, for all types of organizations, funds used by their subordinates or other institutions, as well as performance guarantee and mortgaged funds to participate in economic activities, including appropriated funds for wage payment, demolition compensation, security deposit and other funds under custody and provides custody account opening, fund safekeeping, agreed fund transfer and other services.